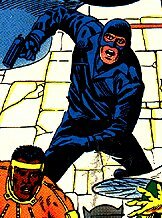 Powers/Abilities: The Black Hood wears a special utility vest, full of pockets containing useful equipment. He normally wields a "Pepperbox" pistol. History: Kip Burland was a police detective, and a good one. When his work was interrupted by the discovery of departmental corruption and crime in high governmental offices, he travelled to Houston, Texas, to seek advice from his Uncle Matt. Hearing about the problems facing his nephew, Matt Burland let Kip into a family secret. 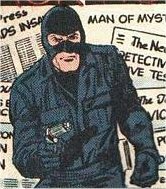 For centuries, when injustice arose and legitimate avenues of dealing with them were blocked, the Black Hood had been adopted as a secret identity to allow righteous retribution to be delivered. 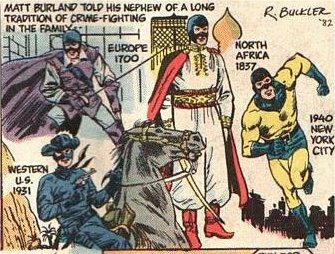 Matt had been the last Black Hood, back in the 1940's. Now it was Kip's turn to take up the good fight.